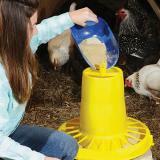 Use this durable plastic feed scoop to feed sheep, goats and chickens. Color of scoop may vary. 5 lb capacity. 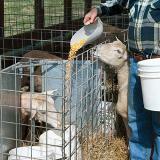 To scoop feed for sheep, goats and poultry. Love this scoop. 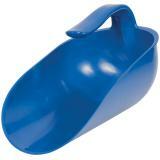 All our other scoops are not being used because this scoop is so much more comfortable and easier to use. I need to get the smaller size too. 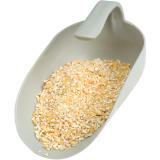 This scoop makes it so much easier to scoop feed out of a feed bag or a bucket. So much less torque on the arm. The handle doesn't snag on the feed bag. My only worry is that the handle might break. But so far so good. I might order the metal scoops next time. Great scoop. Easier to use and sits nice in the hand. My go to scoop. I really like the shape and feel. It has been quite sturdy for me. I bought it a year ago. The best scoop ever. Sturdy and efficient design, well made, all edges are rounded, feels good in your hand. I bought 3, hoping to never lose one. Beautiful design, great color with a scoop that is either too big for the handle, or a handle that is not strong enough for the size of the scoop. Either design flaw results in a broken handle.